While there are rumblings about the ‘Hispanic’ vote in the political arena, it is my belief that Mitt Romney is making a sincere effort to reach the American ‘Hispanic’. The Republican National Convention, I can proudly say, showcased many of the Republican Hispanics now in office. These conservative Republicans have emerged through hard work and dedication to their firm belief in traditional values. These leaders understand the truth of the situation in which we find ourselves today. They understand the dismal economic situation and the moral decay encouraged by the present administration. Because the American Hispanic was highlighted at both the Republican and Democrat National Conventions, I will focus on the emergence of the American Hispanic office holders and nominees. If you think that this ‘Hispanic’ thing is a ‘fad’, think again. The reality is that Hispanics have attained status in American politics that can no longer be ignored. It is time we acknowledge that the Hispanics are here to stay. 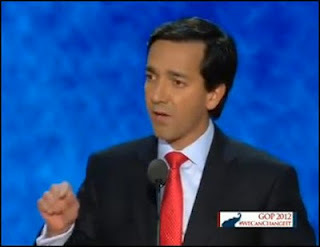 The National Republican Party and Romney did a superb job introducing and highlighting the Hispanic at the RNC. Now, it is our turn to not only welcome the Hispanic nominee or incumbent candidate, but to work hard to make sure they are reelected or elected. Again, I want to remind you that the word ‘Hispanic’ is a made up word by the federal government to try and put all Spanish speaking individuals in a pigeon hole. In Texas, we have mostly Americans of Mexican descent. The typical Mexican American is hard working, has strong family ties, and believes in traditional family values. In Texas we must continue to elect strong conservative Hispanic Republicans to office. If we do not, Republican Texans may find that the Democrats might one day rule again. 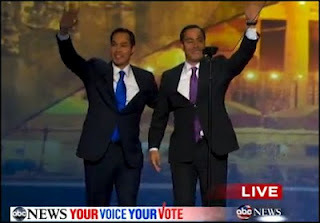 Twins Julian and Joaquin Castro are being prepped by the liberals to be the next US Congressman, or US Senator, or the next Governor of Texas or the next president of the US, and we must not take them lightly. If elected to higher office, these two will perpetuate the extreme liberal agenda. Caution must be taken that our conservative values be passed on to our children and grandchildren. As of August 29, I found a new female role model, and her name is Governor Suzanna Martinez. I totally cherished the moment when she told her story of how she became a Republican. While out with Republicans wanting her to move to the Right, they spoke about issues such as welfare, size of government and other conservative issues. 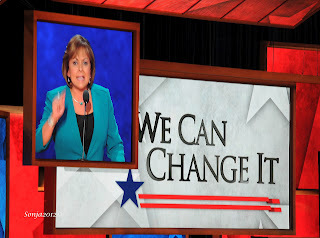 Governor Martinez had an epiphany that she and her husband, Chuck, were indeed Republicans by saying to him, “I’ll be damned, we’re Republicans.” Yes, the Mexican American is as a rule a conservative and matches perfectly with the Republican Party. The problem is that most Hispanics don’t like to talk in terms of Republicans and Democrats. Governor Luis Fortuna described in detail the $3.3 billion deficit that prevailed in Puerto Rico when he took office. He acknowledged that Puerto Rico was facing bankruptcy and how he was able to lead Puerto Rico out of economic death. I was quite impressed when he said that he cut his own salary and reduced deficit by 90%. He said that while we tightened our budgets, Washington DC continues to spend. “Freedom,” he said, “is the essence of who we are as Americans.” Another fact that I did not know was that over 200 thousand Puerto Ricans have served in the US military. 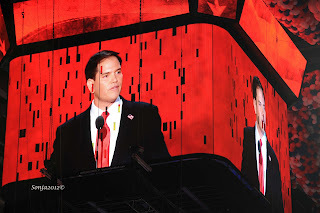 US Senator Marco Rubio from Florida is still my favorite speaker. He had the honor of introducing Mitt Romney to the delegation. His words flow easily and embrace his beloved America. How can you not like a man who loves his God and Country? His first request was asking for prayers for Cuba to be set free. Rubio oozes with love for the freedom America stands for. And yes, we are in trouble but we still stand for Freedom! If you want to hear positive thoughts, listen to Rubio. Un govierno limitado y con menos impuestos, significa mas oportunidad y mejores empleos para un futuro mas prospero para las siguientes generaciones! Con Mitt Romney como presidente, lo podemos hacer!!!! 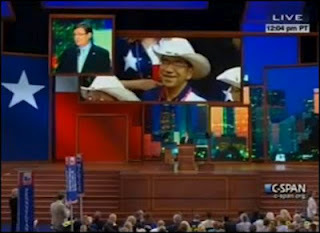 Many of you told me that you did not see or hear our Texas Congressman Canseco address the delegation at the convention. This is a strong indication that the liberal media does not want America to know that the Republicans had a Hispanic Congressman present on the stage speaking about something other than immigration. Congressman Canseco is seeking reelection in his CD23 and knows that his presence in DC is necessary to fight for our Constitution, work towards legislation to find jobs and to rid America of the ObamaCare blight. 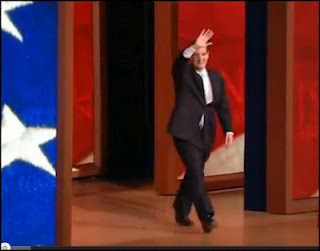 Nothing but pride came over me when Ted Cruz appeared on stage. His tall presence reminded me of a Texan arriving just in time to save the future of all Americans, someone who will fight to restore our Constitution. He spoke from the stage without a podium, just face to face with the delegation. He reminded us all about the tremendous work of the grassroots who stood united for ‘Liberty’. I feel compelled to insert the Castro brothers to emphasize the harsh difference of the Republican Hispanic and the Democrat Hispanic. Julian Castro, the mayor of San Antonio, Texas is riding a wave that could land him in the WH someday. We must make sure this does not happen. Just this morning he was part of the discussion on MSNBC the Daily Rundown with Chuck Todd. Julian is promoting his Pre K program that he wants so badly for San Antonio. His brother Joaquin Castro is running for CD-20 against another Hispanic with a different ideology, David Rosa. Bexar County must stand up to these men who have every intention of making their hometown and mine BLUE. According to some polls, Romney is behind in the battleground states of Virginia, Ohio, and Florida and we need to be aware that Colorado must vote Republican, if we want to win back our country. We must make every effort to bring in the Hispanic vote because it will be crucial in November. Every vote will be crucial to our victory. How I long for a landslide. Don’t forget to share this with all of your friends and neighbors especially if they live in the battleground states.